Well, of course you are! You are getting married! This is one of the most expensive adventures you are likely to encounter in your life! 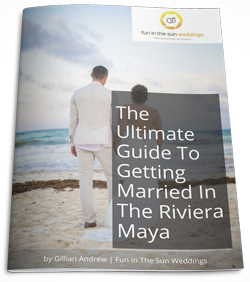 And I can appreciate that the best Riviera Maya wedding photographers are not cheap. So, in the interest of saving you a few hundred (or thousand!) bucks in that tight budget of yours, here is some advice on how to plan your wedding timeline to get the best bang for your buck with photography. Always begin planning your destination wedding by learning what time the sun sets on your wedding day. After all, you are coming all the way to Mexico to get married, so you want those coveted sunset beach wedding photos, right? The smart beach bride knows that you should have the ceremony at least one hour before sunset. Two hours before would be better. Dedicate a full hour for fun beach photos with your wedding party, and romantic sunset shots with your Love. Budget saving tip: Move immediately from saying “I Do!” to your beach photos. Do not stop to strike a pose with every guest who wants one after the recessional. This is a major time zapper, and time is money on your wedding day. The best wedding photographer knows that you do not need hours set aside for ‘getting ready’ photos. We can begin by spending 15-20 minutes shooting the groomsmen, then leave the boys to enjoy a cocktail while we capture the bride being helped into her dress and putting in her earrings. Budget saving tip: Schedule the photographer to start shooting one hour before the ceremony. You do not need to have professional pictures of your hair and makeup being done right from scratch. It is possible to capture the key moments in your wedding reception, even on a tight wedding budget, as long as you stick to a smart timeline. As you enter your wedding reception, all of your wedding guests will be gathered enjoying a cocktail and hors d’oeuvres. With all eyes on you, go straight into your first dance. After that, your photographer can wrap. Budget saving tip: Hire your photographer for less time and trust that Smartphones and guests’ cameras will capture the reception debauchery and Uncle Dan’s drunken dinosaur dance! Wedding photography will be one of the biggest expenses at your destination wedding. Get everything you want without paying for anything you do need by figuring out how many hours you need to hire a wedding photographer for. ***And! If you happen to be looking for the best Playa del Carmen wedding photographer for your beach wedding then contact us now! We are Fun In The Sun Weddings, for the best Riviera Maya wedding photography in Playa del Carmen, Tulum and Cancun. What is your wedding budget saving tip? I want to hear about it in the comments below!